Aiden Ineson scored a try and goal in Dewsbury Moor's friendly defeat at Dudley Hill. The Heavy Woollen District ARL have named an 18-man Under-23s squad who will travel to Greece to play an Athens Select team on Friday Marsh 15. The squad have been training since just after Christmas and the coaches have picked 18 players who will represent the district. The tour will be led by former Dewsbury Moor coach Allan Samme, with support from Jimmy Hooley, of Batley Boys, and Dewsbury Celtic stalwart Danny Lee. Seven clubs from the Heavy Woollen District have representatives in the squad, with players from the five local National Conference League side all selected. Dewsbury Moor have five players in the squad, Dewsbury Celtic have four, there are three from Shaw Cross Sharks, two apiece from Thornhill Trojans and Batley Boys with Birstall Victoria and Ossett Trinity having one each. Heavy Woollen District Under-23s squad: Brandon Bates (Ossett Trinity), Thomas Bottomley (Dewsbury Celtic), Cameron Bruce (Dewsbury Moor), George Croisdale (Dewsbury Moor), Bradley Foster (Dewsbury Moor), Paul Foulstone (Dewsbury Celtic), Matthew Goodwill (Birstall Victoria), Joe Halloran (Shaw Cross Sharks), Aiden Ineson (Dewsbury Moor), Owen Lumb (Shaw Cross Sharks), Will Poaching (Thornhill Trojans), Benjamin Ripley (Shaw Cross Sharks), James Samme (Dewsbury Moor), Josh Scrutton (Batley Boys), Luke Sheridan (Batley Boys), Nathan Waring (Dewsbury Celtic), George Woodcock (Thornhill Trojans), Billy Yarrow (Dewsbury Celtic). 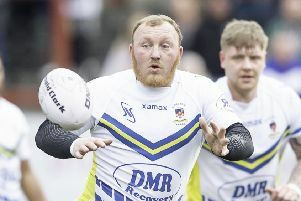 Dewsbury Moor slipped to a 16-10 defeat against Bradford Dudley Hill in a pre-season friendly last Saturday as they build towards the new National Conference League campaign, which begins in late February and early March. The sides swapped places last season with Dudley Hill relegated from Division One and Moor securing back-to-back promotions to the second tier. An impressive first half display by Dudley Hill set up the win as Neil Wall scoring two tries, with Adam Jefferson also crossing and Chris Hanson adding two conversions as they led 16-4 at the break, with the visitors replying through Dom Horn. Aiden Ineson nipped over for the Maroons within four minutes of the restart, duly improving his own score, to give them hope of producing a fight back. However, there was no further addition to the score as Dudley Hill held on for victory. Dewsbury Celtic lock horns with Shaw Cross Sharks in a pre-season friendly at Crow News Park this Saturday.